Looking for a white blouse update? These feminine blouse styles will charm you instantly. White tops can be as basic as you need them to be. If you’ve loaded your closet with them, then you’ll know that you need a white blouse that has that extra something along the demure ladylike lines so you can pair with contrasting casual bottoms or work into a top-to-toe feminine look. Either way, the presence of a white top with sweet detailing that sets it apart can do quite a lot in the most simplest of looks. 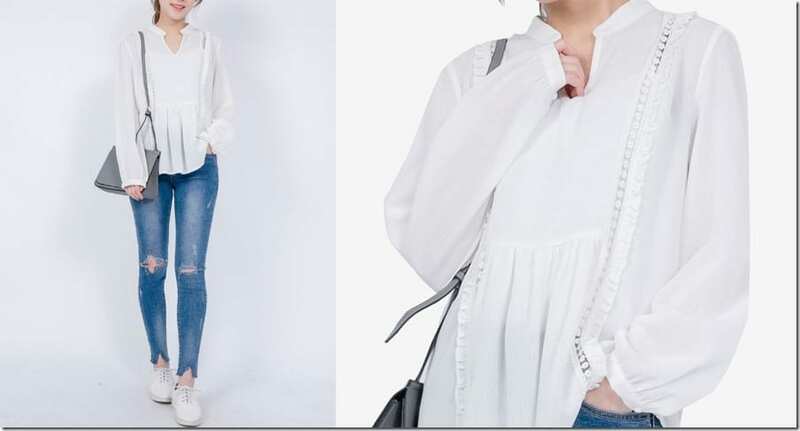 I love looking through white blouses with eye-catching details in the sleeve, neckline and overall shape as I find that with a non-color canvas, these does pop out visually but also quite subtly. If you are a fan of white tops, tees, tanks, shirts and blouses and looking for one with something distinct, then I hope you’ll be drooling looking at the selection I have for you down below. These white tops are available for grabs on ZALORA Malaysia. Which sweet white blouse would you love to wear? Share below – I’d love to know!